Inside his office at The Blues Foundation in Memphis hung a painting of Bonnie Raitt and a guitar signed by the late great B.B. King. 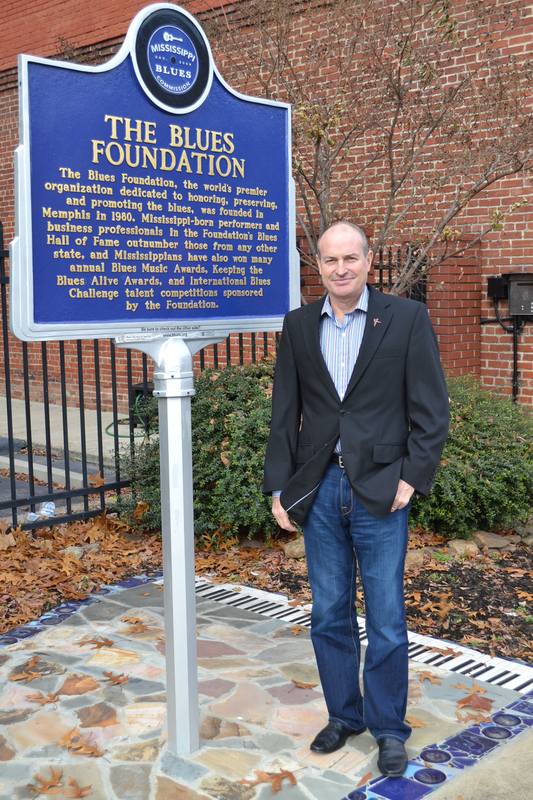 It’s not every day that a person gets to work on behalf of his musical heroes, but not every person gets to be Jay Sieleman, past president and chief executive officer of The Blues Foundation. Jay Sieleman was born and raised in Oelwein Iowa, with a penchant for hard work and a love of music. He graduated from the University of Iowa with a Bachelor of Arts in political science in 1975 and a Juris Doctorate in 1978. This was followed by stints working as an attorney inside and outside the U.S. In 1993, while at a jazz festival in New Orleans, he became aware of the Ultimate Rhythm & Blues Cruise. His first Blues Cruise was in January 1994, and it was life-changing event. Because of the cruise, Jay learned of The Blues Foundation and the Blues Music Awards, he then visited Memphis for the first time in 1996. 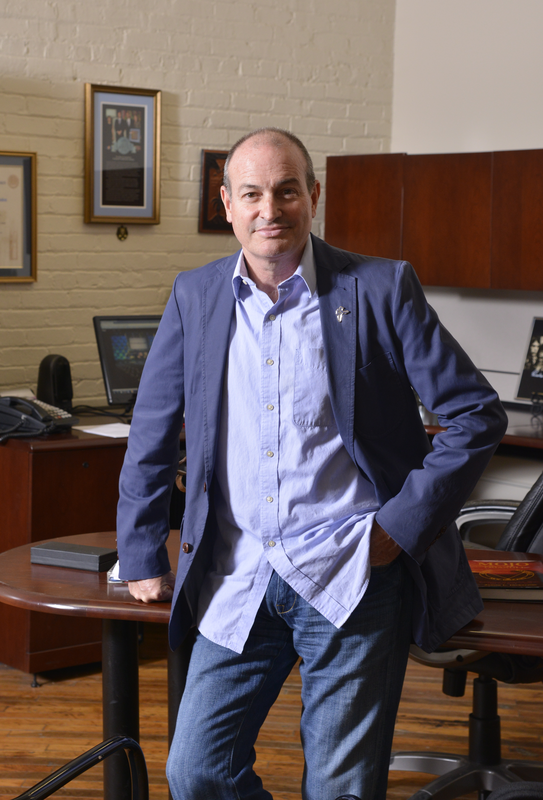 He volunteered to help The Blues Foundation and served on its advisory board from 1999 to 2003. While living in Panama, he wrote articles for the website, and advised the foundation and blues societies on aspects of nonprofit law—even spending a month living with a friend and working in the Foundation office. In 2003, The Blues Foundation offered Jay the position of director of administration. In 2005, he became the executive director, the title changing to president/CEO. Anyone associated with blues music will confirm that Sieleman’s work at the foundation kept the blues alive. Thanks to his tireless leadership, The Blues Foundation is now the largest and most renowned blues organization in the world—dedicated to preserving the music, celebrating performance excellence, supporting blues education, and strengthening the future of a music profoundly important to American history. Under his leadership the Foundation’s net worth grew by millions and membership tripled to 4,500 individuals, plus over 200 affiliated blues societies representing another 50,000 fans around the globe. Master of Ceremony for HOF Bryan Church with Sieleman. At that time the headquarters were housed in about 2,000 square feet at 49 Union. Visitors would come from all over the world expecting something to be there that exemplified the blues and what The Blues Foundation represented. There wasn’t. In 2010, The Blues Foundation bought a 12,000-square-foot, two-level space on the ground floor at 421 S. Main. Sieleman retired from his position as President and CEO in 2015, but not before he had helped to raise over $3 million for The Blues Foundation, and officially oversaw the opening of the Blues Hall of Fame in Memphis. 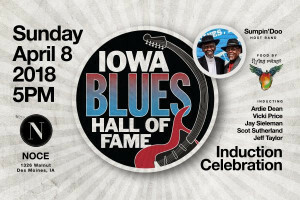 The Blues Hall of Fame finally had a home, the world a destination where blues legends can be properly honored for their work, and Jay Sieleman a legacy of keeping the blues alive. 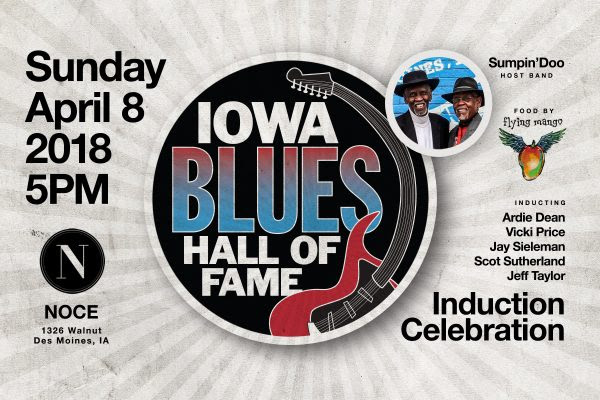 See the full list of the Iowa Blues Hall of Fame Members – This list contains such notables as Bob Dorr, Bo Ramsey, Dartanyan Brown, Elvin Bishop, Patrick Hazel, Richie Hayward, Ron DeWitte, Stephen Miller, and more. Jay Sieleman (born and raised in Oelwein Iowa) former President and Chief Executive Officer of The Blues Foundation, the Memphis-based international nonprofit organization whose mission is to preserve Blues history, celebrate Blues excellence, support Blues education and ensure the future of this art form. Since taking the reins of the Foundation during a period of financial and administrative turmoil, the Foundation has experienced a remarkable turnaround, growing from a net worth of less than $200,000 to over $3 million, with net income each year since 2004 now based on $1 million dollar in annual revenues. During this time, the Foundation has staged its best-attended and most highly-acclaimed Blues Music Awards and International Blues Challenges and tripled individual memberships (4100) and doubled affiliated blues societies (200). Each of these has contributed to a much-improved reputation both in the Blues world and the general public. The Blues Foundation has become more internationally focused each year with members in more than forty countries. 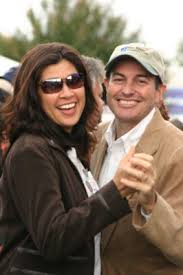 The Blues Foundation is 2011 Tennessee Governor’s Arts Award recipient. He led the $2.8 million capital campaign to build the Blues Hall of Fame in downtown Memphis which will open in May 2015. I was born in Oelwein, Iowa, northeast of Waterloo. It was a town of about 8,000, a typical farm-to-market town but for one thing: Oelwein was also a railroad town — a hub for Chicago Great Western Railroad, with both blue-collar and white-collar jobs. A lot of Italian-Americans and Mexican-Americans worked for the railroad and lived in this small Iowa town. 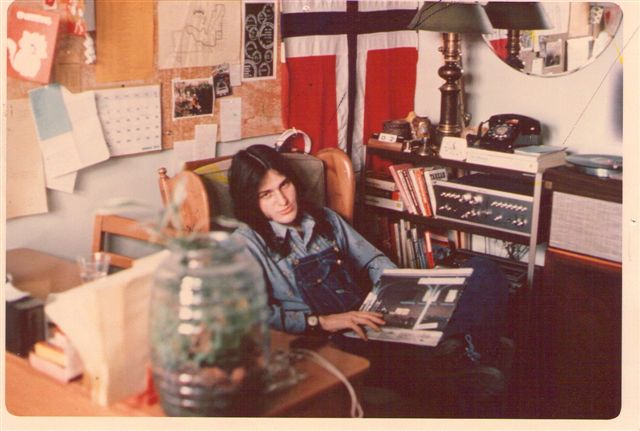 Jay – His college years. I’m the second oldest of five children — two brothers (Greg and Scott) and two sisters (Wendy and Lori). Activities were generally centered on school — sports, plays, and that sort of thing. There was one movie theater and a drive-in during the summer. We lived in three homes as I grew up — one until I was 7, one until the seventh grade, and then one through high school — but we always lived in the town of Oelwein. My parents were upwardly mobile; owning bigger houses was the dream, and that’s what they did. Back then, getting a better house was the priority. My dad, Robert Sieleman, worked four jobs during his career. When I was very young, he held a white-collar job at the railroad. He then drove a delivery truck for a large laundry service in town. Then he sold all types of insurance. His final career was running the chamber of commerce. He was a very outgoing man and was one of the most well-known, well-liked, popular people in town. He was always involved in community activities and was very much involved in the local Democratic Party. He treated my mother with respect, and he worked hard. I learned those values from him. My mother, Ann Sieleman, was a nurse at the Catholic hospital and later got a job as a public-school nurse. She was more reserved, very intelligent, and rather strict in her ways. She was not someone to lie to. She was not naive or easily fooled by the things that all kids think they can get away with. My father loved music and had a rather large record collection, so I was exposed to music and gained an appreciation for it at an early age. My older brother started buying 45s, and then I started buying 45s, and I’ve bought and collected music ever since. 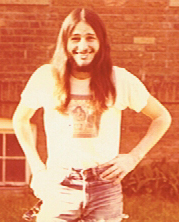 Beginning in high school, people started looking to me to know about music. They’d ask me questions. I read about music, bought music, studied music, and paid close attention to what was going on in the industry. It was a hobby that became a job, in essence. After high school, I had this idea that I wasn’t going to go to college right away, so why think about what I was going to do career-wise? My mother was beside herself. She knew that was the wrong way to go. I first went to a junior college because I had made no effort to apply to any universities. 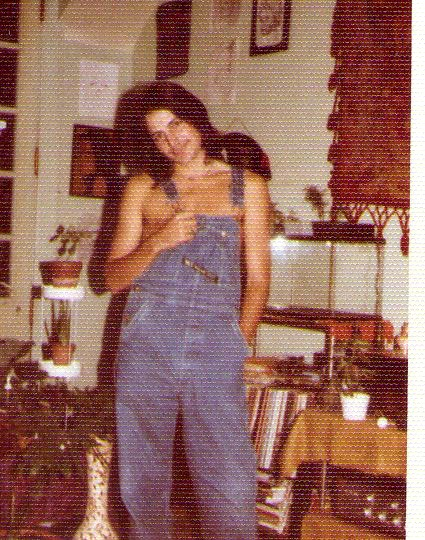 It was the ’70s, and a lot of people my age thought the idea of entering the normal world — the “straight world” — was like, “Yeah, maybe, but what’s the hurry?” It was a hippie-type thing. Almost as soon as I entered college, I knew I was heading into law. I got my B.A. in political science from The University of Iowa in 1975, followed by a Juris Doctor in 1978. Becoming a lawyer seemed a natural fit because I developed arguments and defended neighborhood kids and classmates from a very young age. I thought I was pretty good at explaining my way out of things! During college, I served as an intern in the Iowa Legislature and, later, as an intern in the U.S. Senate. I didn’t have any money, so I wasn’t buying music, but I was listening to other people’s music. At parties, I’d spend my time looking at and reading the host’s record collection — the Stones, Creedence, Steppenwolf, Sly, and then later on, ZZ Top, Lynyrd Skynyrd, George Thorogood, and Little Feat. All pretty much rock ‘n’ roll. I wasn’t so much into pop rock, although I liked the singer/songwriter work of Joni Mitchell, James Taylor, and people like that. But not art rock or heavy metal or country rock. My first job out of college was as the assistant county attorney in Des Moines. I was the first full-time juvenile prosecutor in the state. The summer before I graduated, I had served in Washington D.C. on the Senate Judiciary Committee’s Juvenile Justice Subcommittee, so I had some experience. I worked as the juvenile prosecutor for four and a half years. The Peace Corps had been on my radar ever since President John F. Kennedy established it in 1961. One day in 1982 in the Des Moines paper, I saw that a recruiter was coming, and I went to check it out. I was ready for a change. I became a Peace Corps volunteer and headed to the Solomon Islands, South Pacific, in 1983 to serve as a provincial legal adviser. My contract was over in 1985, and it was time for me to get back to the world. I went to work in Atlanta as an attorney for the U.S. Department of Health and Human Services. One of the attorneys I worked with brought to my attention a job opportunity with the Panama Canal Commission, which was the U.S. government agency based in Panama that ran the canal. I was ready to leave the United States again so I could experience the enjoyment of being somewhere new and different. This was during the final period before the United States transferred the canal to the Panamanians. Trouble was already brewing at the time in Panama against Noriega, but that didn’t worry me. To this day, I don’t know if I got that job because I was the best qualified or because I was the only person who would move to Panama when it was on the verge of war. For the first time in my life, I had some discretionary income. I started listening to and buying a lot more music, building a big collection. CDs came out and could be shipped from all over the world. Then, in 1993, I was at a jazz festival in New Orleans, and I was standing behind two guys. They both had on the same T-shirt, advertising the Ultimate Rhythm & Blues Cruise. So I’m doing the white-guy dance thing and looking at their T-shirts. I said, “What’s up with this Blues Cruise?” They told me. 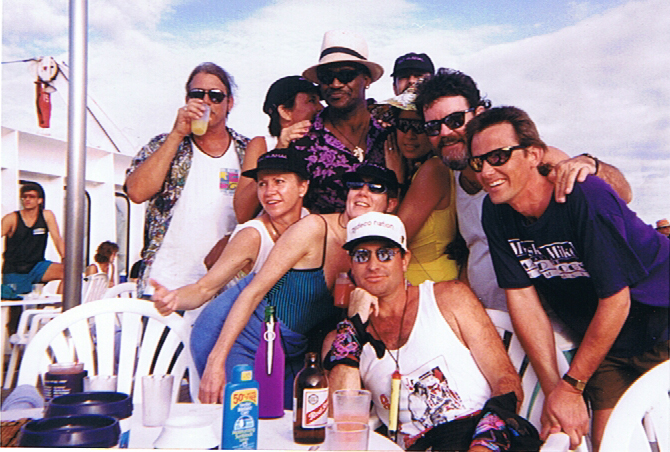 I went on the Blues Cruise in January 1994, and it changed my life. Koko Taylor, Lonnie Brooks, Marcia Ball, and half a dozen more were there. Unbelievable. The musicians hung out with us and were personable. Going on the Blues Cruise became an annual thing for me. As a result of the cruise, I learned about The Blues Foundation and the Blues Music Awards, and I visited Memphis in 1996. It was a bit like Alice in Wonderland falling into the rabbit hole: Why didn’t someone tell me about this whole blues world before? I volunteered to help The Blues Foundation and served on its advisory board from 1999 to 2003. In Panama, I wrote articles for the website, and I advised the foundation and the blues societies on aspects of nonprofit law. In 2002, I came to Memphis for a month, stayed with a friend, and volunteered in the office. In 2003, The Blues Foundation offered me the position of director of administration. In 2005, I became the executive director, and my title is now President/CEO. Our headquarters were housed in about 2,000 square feet at 49 Union. Visitors would come from all over the world expecting something to be there that exemplified the blues and what The Blues Foundation represented. There wasn’t. 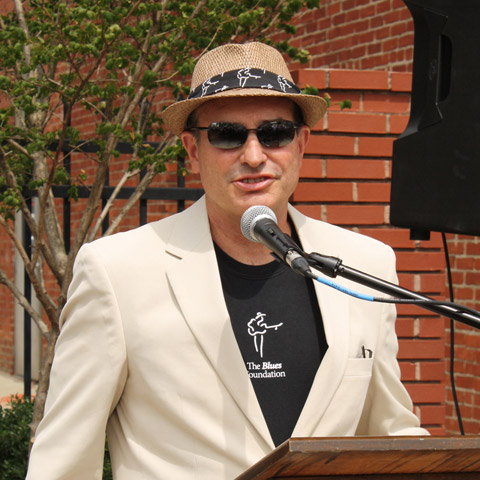 Blues Foundation President Jay Sieleman welcomed the crowd to the marker unveiling, which took place next to the headquarters at 421 S. Main Street in Memphis. So, behind the scenes, we were supporting and growing our mission, but publicly and physically, we were not. My goal was to get a place that enhanced our ability to further our mission. In 2010, we bought a 12,000-square-foot, two-level space on the ground floor at 421 S. Main. We’re now in the midst of a capital campaign to establish the Blues Hall of Fame here. We’re more than 75 percent of the way there, so it is going to happen. The only question now is how quickly. Our hopeful scenario is that by the end of 2014, the Blues Hall of Fame will be finished and ready to open. The purpose of The Blues Foundation … We were founded in 1980 and are world-renowned as the organization dedicated to preserving blues music history, celebrating recording and performance excellence, supporting blues education, and ensuring blues music’s future. The foundation has 4,500 individual members and 200 affiliated local blues societies that represent another 50,000 fans and professionals around the world. When I came on board in 2003 … I had to cut my own salary. The foundation was in financial and administrative turmoil. On some debts, we hadn’t made payments in years, and we were holding creditors at bay. It was then a question of whether we had enough money to make payroll. The problem was too much spending and not a good enough product. As a result, we were losing members and support. I turned the organization around by … cutting expenses, reducing staff, and making a better product so that blues fans and blues musicians would come back and start supporting it as something valuable. At times, there were only two of us, and even today there are only three full-time staff members. I didn’t have to strategize much; I just had to look around and there was always something to do. So I just kept doing things, staying focused, putting in the hours, and not wasting time. And it paid off. We saw significant income growth for 2004 and have seen significant income growth ever since, growing the organization into a million-dollar operation by 2011. I’m so passionate about what I do because … blues is fun. And when I started meeting blues musicians and discovering what good people they are, I wanted to make their lives better and try to make this organization one that helps them succeed in what they are passionate about. I want to run a top-notch organization and host events that are as well run as possible so musicians are treated with respect, more fans come, and everyone has a good time. If you really dedicate yourself to doing this, there are rewards for the people you’re trying to do it for. My favorite blues musician … Taj Mahal. In the ’90s, Taj was playing with a group called The Phantom Blues Band. Seeing him and the band on the pool deck of the Blues Cruise was about as much fun as you could ever have. And then Taj’s music is so varied. He’s played Hawaiian blues, Indian blues, soul blues, country blues — he made an album with just him and tubas! He made a reggae album before I’d ever heard of Bob Marley. He’s like a Sinatra in the sense of what he can do with a song. 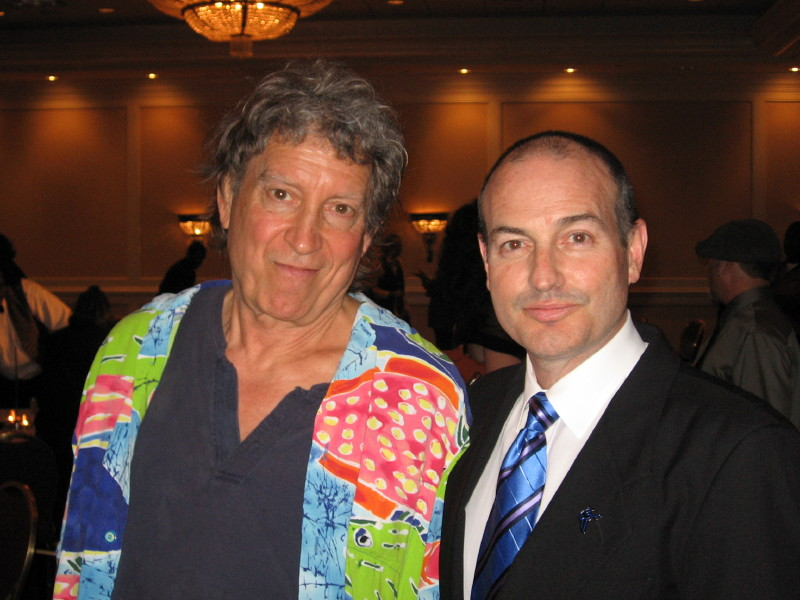 The Blues Music Awards began … before The Blues Foundation even existed. Volunteers created an awards show, and when they saw it worked, they did it again. It’s one of the ways the foundation celebrates the best in blues. 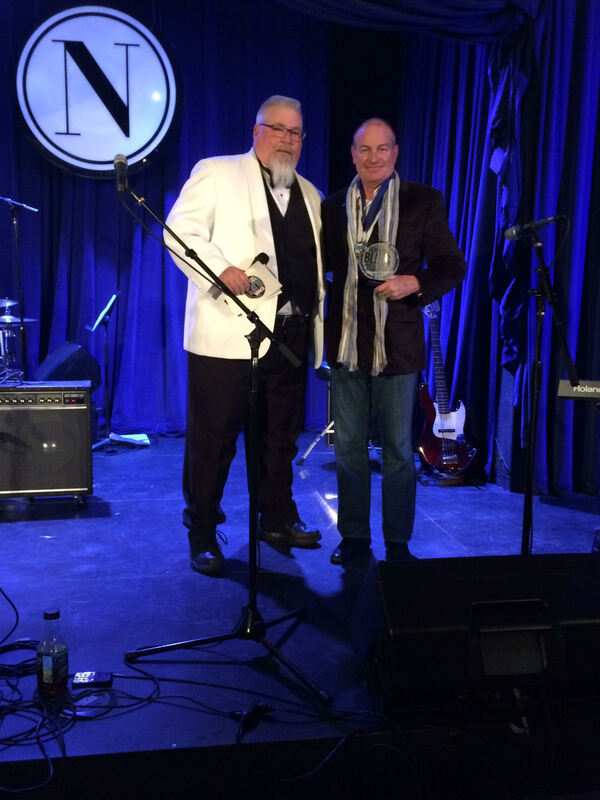 The ceremony in Memphis brings together blues performers, industry representatives, and fans from around the world to recognize the best in blues recordings and performances from the previous year. 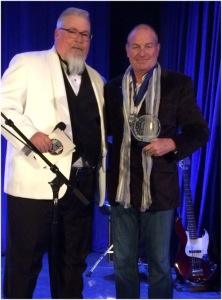 The awards are recognized as the highest honor given to blues artists, who are selected by the foundation’s members. It is the best blues party going, and it is right here in Memphis. 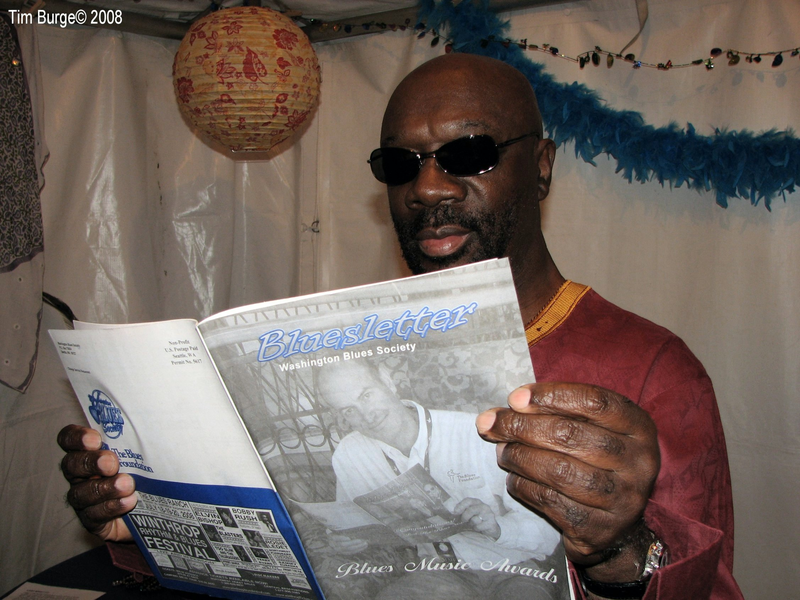 Isacc Hayes reading the Blues Letter. Notice who is is on the cover? Click picture for enlarged view. Our headquarters needed a new storefront because … Visitors from all over the world make a journey to Memphis — the music mecca of the world — and when they come to the world headquarters of The Blues Foundation, they expect to see something more than office cubicles, computers, and a few posters nailed to the wall. As our events grew, as our website presence improved, and as our membership and affiliate groups increased — everything was humming, but we had no physical presence. In 2007, we committed to finding a place that people could visit and get exposed to blues. The idea for the Blues Hall of Fame … The foundation inducted performers into the Blues Hall of Fame in its first year, 1980. Currently, the Blues Hall of Fame is a historical record of those who made the blues timeless through performance, documentation, and recording. Members are inducted annually in five categories: performers, individuals, literature, song, and album. We are now closing in on giving the Blues Hall of Fame a physical presence here. The Blues Foundation has waited 35 years for this. The International Blues Challenge … started in 1984 as the Amateur Blues Talent Competition. During my time, we have done two things: made it much more international and started a youth showcase. The IBC has evolved into the world’s biggest and most respected showcase for blues musicians seeking to take their act to the international touring level — and we now have 25 to 30 youth acts coming to participate. One thing that hasn’t changed … our logo. Whoever created our logo created a real winner! The challenges with finding a new headquarters building … Because this location had been rehabbed into a commercial establishment and used as a public storage business until just a few months before we moved in, it was more or less ready to be occupied. It was of a size and a price that if we didn’t raise a penny, we still had not made a mistake. We could afford to buy it; we could afford to do the small amount of renovations needed to move in; and we could have an office here without raising a dime. It was not a gamble. Not much could go wrong in that scenario. The next generation of blues musicians … There is no shortage of young people playing the blues. Blues, like any music, evolves over time, so young people have had other influences, and their blues may likely be different from their grandfathers’ blues. Generally speaking, younger people play a more rock-oriented blues, but there are also young people who play things that would make you think they were born in 1921. The most controversial thing I’ve done … Perhaps changing the name of the W.C. Handy Awards to the Blues Music Awards in 2006. Often, any change is controversial because people love the status quo even if they don’t know why. The most important reason we changed the name is that we do not have the marketing money to have things that the general public doesn’t understand. The “Blues Music Awards” needs no explanation. And while W.C. Handy is recognized as the Father of the Blues and is an important figure in Memphis, the organization is not as Memphis-centric as it was in the early days. Other ways we promote the blues … is through our programs. Generation Blues is the newest program. It awards scholarships to qualified applicants to study their instrument of choice at reputable blues camps, seminars, and workshop programs around the country. The HART Fund … The Handy Artist Relief Trust provides blues musicians and their families in financial need with acute, chronic, and preventive medical and dental care, as well as funeral and burial expenses. The public’s biggest misperception … Our organization is based in Memphis, Tennessee, but our mission is blues — wherever we find it. As such, we cater to the blues community around the world. Our focus has not been so much on Memphis — until now. Now we’re planning to put a museum, a tourist attraction, and an educational facility in Downtown Memphis that adds to the attractiveness and the importance of Memphis as a musical city. So a lot of people don’t know who we are because we’re not constantly “out there” the way organizations are if their audience is strictly Memphis. Perhaps the misperception is that we’re small or not important, but we are the world’s blues music organization, and blues fans and musicians around the world know that. And because of that, the world thinks of Memphis as the Home of the Blues. The first time I heard blues … I was 17 years old, and I heard “The Thrill is Gone” by B.B. King. I thought, “What in the hell is this?” I was in a friend’s car, and we were headed to Waterloo to see “Woodstock.” I heard it on AM radio, and it remains one of the few blues Top 40 hits. Later, I heard “Smoking Gun” by Robert Cray when I was in Atlanta in 1986. I thought, “This is incredible!” I loved it. There aren’t many blues hits because … the blues didn’t get played enough on radio to become hits. Robert Cray’s “Smoking Gun” may be the last blues hit ever, because no one plays a song enough to be a hit. I met my wife … When I flew to Panama for my new job, I was taken to my temporary quarters, which was two blocks from my new office. The next morning, I was walking to work at 7 o’clock, and a woman drove by and asked if I wanted a ride. She knew who I was because she knew there was an attorney coming, and she saw where I was walking from. I said, “No, thank you, I’ll walk.” I haven’t said no to her too many times since! Anyway, Priscilla Hernandez worked in my building, and we’d bump into one another. We got married on Bora Bora on May 17, 1993, on the birthdate of my favorite blues musician, Taj Mahal. My wife’s involvement with the blues … Priscilla is the unofficial first lady of the blues. She has no title, and she doesn’t work here, but she’s been a volunteer for years, and she has taken on the role of hostess of the blues community. She’s very well known and respected around the world in that capacity. She opens a lot of doors for us. She’s very outgoing and talks to everybody. Her work helps the foundation and me tremendously. During grade school, I wanted to … play shortstop for the Cincinnati Reds because of their ballplayer Frank Robinson. There was one game on TV a week — Saturday afternoon. Frank Robinson would impress me with plays that went above and beyond. Growing up, race … didn’t mean anything. It wasn’t even on our radar or was anything we thought about — at least not in my family. My first sports hero, Frank Robinson, was African-American, but that didn’t even register with me at the time. My first paying job … Delivering Fuller Brush catalogs door to door with my two brothers. My time in the Peace Corps taught me … It was a life-changing experience. It’s true that Peace Corps volunteers get a lot more out of it than what they give. To live in a country where most of the people walked around barefoot, lived in rural villages — it opened my eyes that there are more ways to live in this life than just the American way. One way is not better than the other; they’re equally acceptable and equally valid. I came away with a greater respect for other people. It was the first time I’d lived outside of Iowa, but once I left Iowa, I realized how my view of the world had changed forever! When I’m not listening to the blues, I … love Frank Sinatra. Being a blues fan … says more about you than just your taste in music. There are other values that come with that, one of which is tolerance for other people. If the altar you’re worshipping at is music created by African-Americans, it’s hard to be an intolerant racist. My final 2 cents … I came to Memphis thinking I knew a little about music, and I found that Memphis is way bigger and way richer and way deeper than even a music fan like me thought. And when you’re here, you run into people from all over the world who come to Memphis on purpose. They come here because they are music lovers, and Memphis is the most important city in the history of the world when it comes to music. And while everyone who lives in Memphis doesn’t have to be a music fan, it’s still a fact that Memphis is the greatest music city in the history of the world. 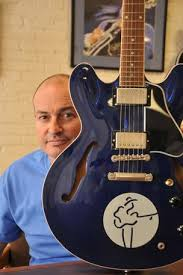 For Jay’s work at the Blues Foundation, Jay Sieleman was the 2015 recipient of the Distinguished Alumni Award for Service from the University of Iowa Alumni Association. He accepted this honor in June 2015 at the Levitt Center for University Advancement in Iowa City. Click here for the story that appeared in the February Edition of the Iowa Alumni Magazine. In October 2015, Priscilla and Jay took Steve Miller on a day long tour of the Delta!!! Born in Memphis April 4 1952, watched moon landing July 21 1969 in your folks back yard. Will never forget that! Thanks for the Montana visit. Was fun. 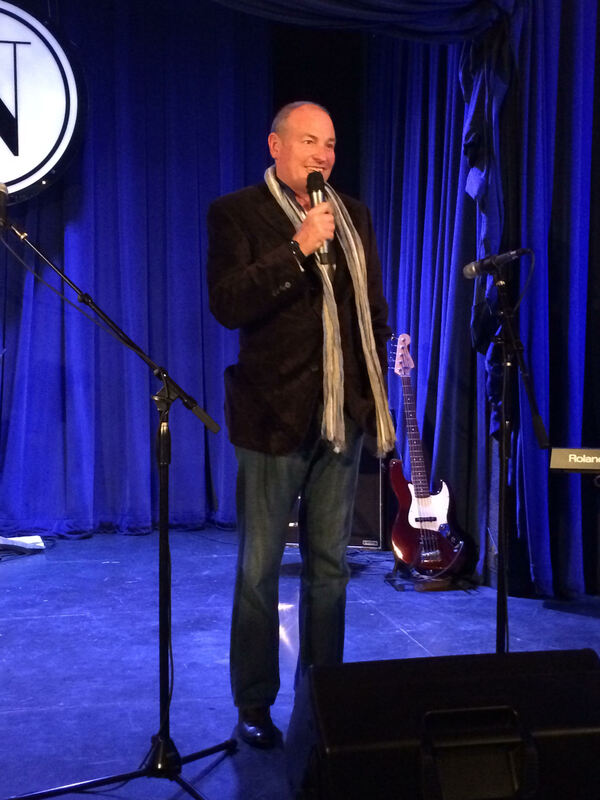 Way to go Jay from a party animal to president / ceo of the blues foundation. Jay I remember you from school very well, you belonged to the popular group unlike me. I love your article, best of all I like that your wife is also Panamanian. Nice to read about successful folks from oelwein. I, as your younger brother, is as always very proud of you! Very nice informative article, but I don’t remember delivering any catalogs! Christmas items maybe. But anyway – nice article!! 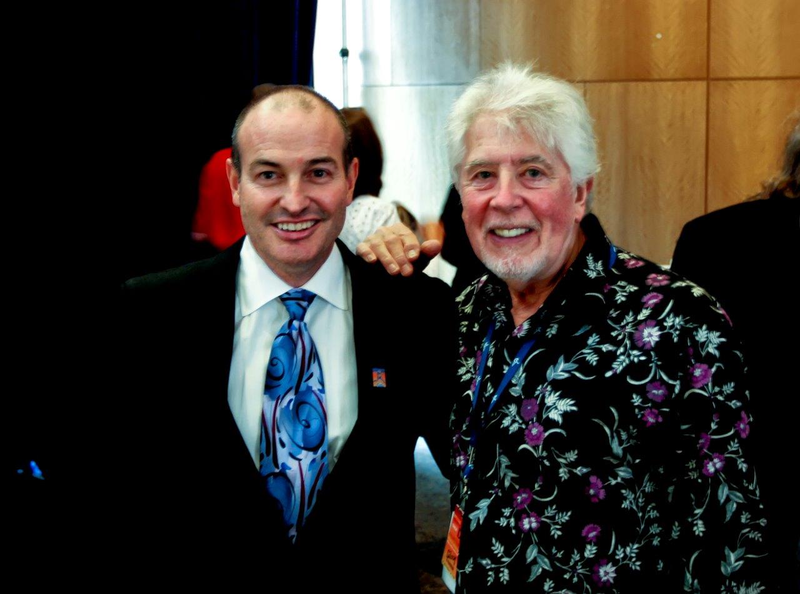 Elvin Bishop and John Mayall. Envious. 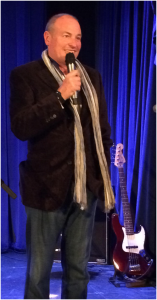 Jay, so very proud of you for what you have done with your life and what you are now doing for the Blues Foundation. Oelwein was a great place to start for all of us! Great article, Jay! If you have a passion for the blues, why not help out your old home town and let’s put together a blues festival. It could become an annual event. You look just like your Dad! Great article, Jay! I totally enjoyed working with your dad at the Chamber of Commerce in Oelwein, Iowa for many years – and totally enjoyed your mother in later years when she became an Oelwein Chamber ambassador with our group.